Levi is a full brother to 2003 colt Luke....what a team they would make! Levi is full of presence ....he seems to know that he is amazing! Debra Edmond convinced me to sell one half of my dream team. Ollie and Elijah, full brothers had been a part of my dream since they were born. I had visions of a flashy Pas de Deux and thrills and fun with combined driving ...looks like Ollie and his new mom are doing great....scored over 75% at their first show (pictured at age 4 training level) Yeah Ollie! Last year, Sonny's Golden Babe (a lovely palomino mare) produced a solid black filly--No Tellin'. 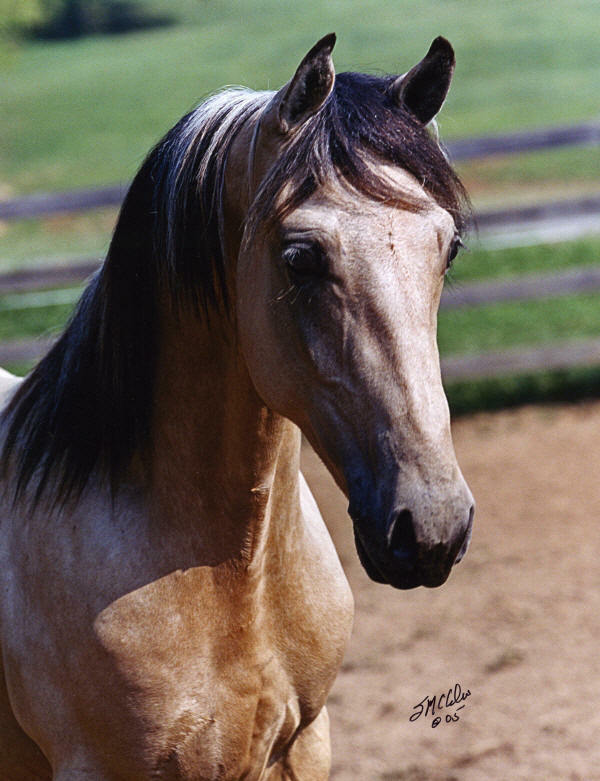 With Nico throwing 75% pinto, we felt a palomino/white pinto would be very fun......and imminent. This year's foaling was like opening a Christmas gift. Lilly was as big as a house.....first one leg, then another, then a nose.......hmmmm......what color is this? As this big handsome colt began to dry, we realized he was a beautiful buckskin! Wow.......he will knock your socks off. Excellent sporthorse prospect! 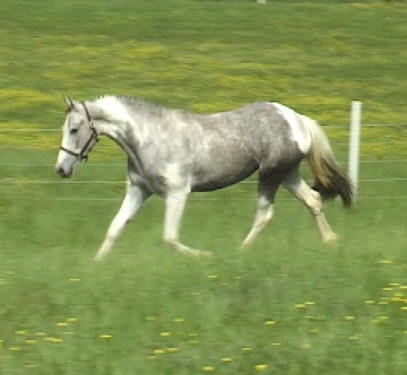 Dorothy is an exotic grey and white (born chestnut/white but rapidly greying) with tons of personality. She is put together perfectly, beautiful conformation and very uphill. All-around sporthorse look and potential. Picture perfect....a performance prospect that would like to ride to the show in the cab of the truck on your lap! (I know we said perfect too many times....but she is!) She is 3, under saddle ...would excel in dressage, hunter jumper or eventing. Fancy movement for the ring and ground covering trot (she can eat up the dirt!) and canter for the event or cross country discipline. She will be a horse that anyone can ride ...even as a youngtser. Impressive filly! Another fantastic foal out of Pure Brass. She's a proven mare who produced Mighty and Solomon. This is our third pinto out of this dam, and her quality is obvious. She's flashy and fun with an awesome personality. Tall and striking with excellent feet and fancy movement. Bold with presence and personality. Very promising all-around prospect. "I have never had a horse that was just so nice, so easy going and so willing to work." 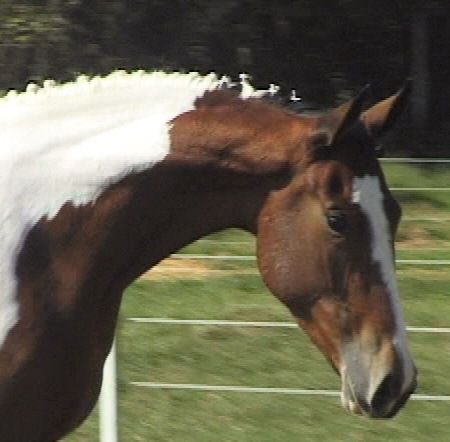 A quote from her new owner, dressage rider Jennifer in NC. Thank you Jennifer and Chuck for the tour of the farm ...you do have my dream riding arena!